The Node.js child process module provides the ability to spawn child processes in a similar manner to popen(3). child_process.exec() method: This method runs a command in a console and buffers the output. child_process.spawn() method: This method launches a new process with a given command. child_process.fork() method: This method is a special case of spawn() method to create child processes. The child_process.exec() method runs a command in a console and buffers the output. 1) command: It specifies the command to run, with space-separated arguments. cwd: It specifies the current working directory of the child process. env: It specifies environment key-value pairs. uid Number: Sets the user identity of the process. gid Number: Sets the group identity of the process. callback: The callback function specifies three arguments error, stdout and stderr which is called with the following output when process terminates. Let's see the simple process example to print architecture, pid, platform and version of the process. It will execute two commands dir and mkdir child. The dir command will display list of current directory and mkdir command will create a new directory. For linux, you can you ls command to display the current directory list. It will create a new directory also. The child_process.spawn() method launches a new process with a given command. This method returns streams (stdout & stderr) and it is generally used when the process returns large amount of data. 1) command: It specifies the command to run. 2) args: It specifies an array List of string arguments. 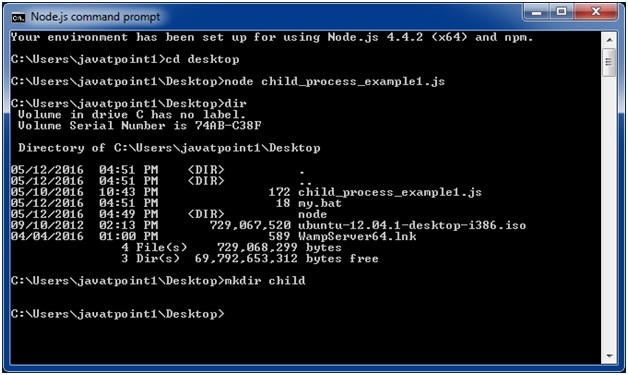 The child_process.fork method is a special case of the spawn() to create Node processes. This method returns object with a built-in communication channel in addition to having all the methods in a normal ChildProcess instance. 1) modulePath: This is a string specifies the module to run in the child. execPath: This is a string Executable used to create the child process. execArgv: It specifies Array List of string arguments passed to the executable (Default: process.execArgv). 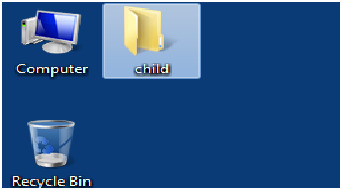 silent: It specifies Boolean If true, stdin, stdout, and stderr of the child will be piped to the parent, otherwise they will be inherited from the parent, see the "pipe" and "inherit" options for spawn()'s stdio for more details (default is false).